Just gotta call it fate. I post the maypole article below a few days ago. 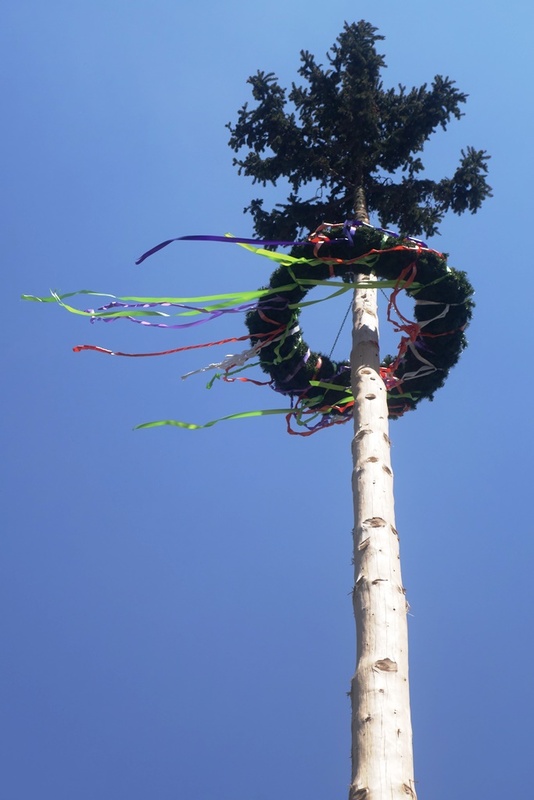 Then just two days later, I am walking through the first district past a cozy little restaurant near the university and low and behold, what greets me — a stolen maypole. Some cheeky students snatched the maypole from the University of Natural Resources and Life Sciences of Vienna (Boku), transported it on the Bim (do maypoles need tickets, Herr Schaffner?) and erected it at that restaurant to hang out for a while and spread May good-cheer to the lawyers, politicians, tourists and students who pass the 1st district eatery on their way to their next appointment. LOVE IT! (see featured photo at beginning of text). Rumor has it that the green-with-envy Technical University students have asked if the stunt qualifies their Boku brethren for extra credit points because everyone knows, “while the TU students are working their butts off for every point possible, the Boku students are racking them in with far easier tasks and twice the fun.” Well, TU students, if you’re good, maybe the Boku students who swiped the maypole will invite you to the Jause and beer that will no doubt be demanded as ransom. While flag-waving workers and balloon-tied toddlers led by SPÖ politicians parading to the beat of marching bands through Vienna’s street culminate in a sea of red at the city’s Rathaus, another Austrian tradition takes places in what may appear to be tranquil town squares throughout the country. Perhaps it’s the chimes of the church bells or the gurgling of the square’s fountain that lure you into the belief that here is one place in the the world at least, where one can sip one’s Melange, admire the budding window boxes and enjoy the scent of freshly baked bread tempting you from the bakery next door. No worries. The universe of this little town square is on its proper course. But then you look up to admire the town’s symbol of pride. The pole that you noticed the townspeople raising the day before with music and fanfare, the tall, slender, wooden pole that towered above the highest house in town with the small pine tree attached to its tippy-top, it’s different now. There’s something missing. The tree! The tree is gone! And from the corner of your eye, you spot ’em. Two young men stealthily stuffing the last remaining pine branch into the back of their Opel before they speed off in the direction of the neighboring village. Yes, in an annual attempt at one-upmanship, villages throughout this serene land of white windy winters that melt into spring, engage in a tradition of a more mischievous thing. They steal each other’s maypoles. And because the maypoles only rival the Gamsbart in their display of pride and masculinity, they are guarded round-the-clock. But some villages prove more clever than others. Upper Austrians, for example, have been quite crafty. In 2012 a group from Engerwitzdorf, a town outside of Linz with just 8000 inhabitants, managed in three nights to steal a total of twelve maypoles from neighboring villages. And afterwards they even had the audacity to cheekily display their bounty along the highway. In Lower Austria, another group of thieves chose an even more brazen place to display their prize — the lion’s enclosure of the Haag zoo. But it’s all in good fun. And tradition doesn’t only stipulate the amount of days that the trees can be stolen (three after being raised) but also the means of return. The home village loads some kegs of beer onto a tractor and drives the ransom payment to the hostage-taking village in return for the “missing” tree. Unless you are the mayor of Linz, in which case you may decide not to pay the beer because the tree went up 4 days before May 1 and was guarded 5 days, and then stolen 10 days after it went up. Whoever said math isn’t useful in the real world? And that sometimes it pays to turn a blind eye to numbers and stringent rules in the name of good fun. Nestled amongst the cobblestones of the Vienna’s 1st district, beside the beautifully orange- and gold-tiled Greek Orthodox Church, is Vienna’s oldest tavern. 1350 (a whopping 665 years ago!) is the first documented date that the building is mentioned in Vienna city records when the place belonged to a knight commoner (yep – even knight status apparently has its hierarchies) by the name of Lienhart Poll. 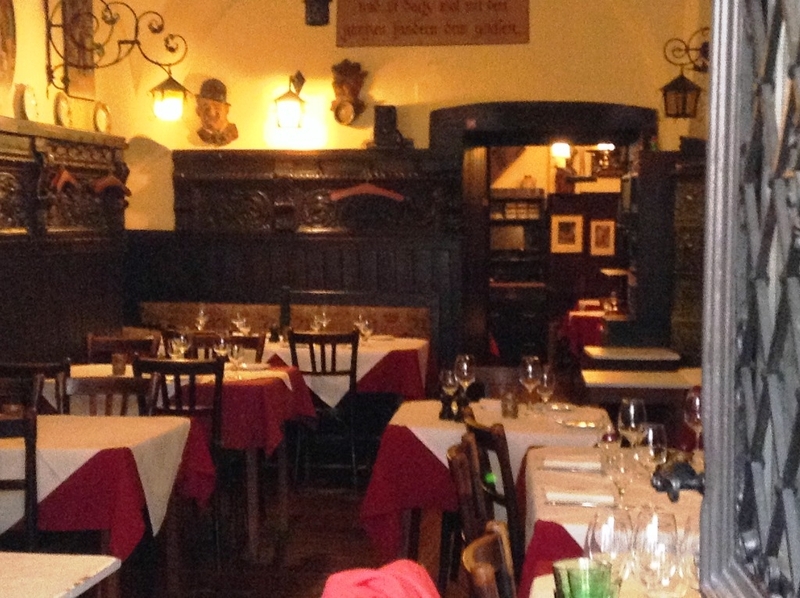 As early as 1447, the building was first used as a tavern which was named “Zum Gelben Adler” (To the Yellow Eagle). mere bubbling 239 years old. This place is almost 3 times older than that. Imagine! I know I’m a sucker for nostalgic tales but how can anyone resist wondering about the musings, confessions, sweet nothings, inspirations, gripes and debates these walls have witnessed while sheltering those who have passed through its doors from the harsh elements of fires, plagues, wars, and weather. Isn’t it cool to imagine? 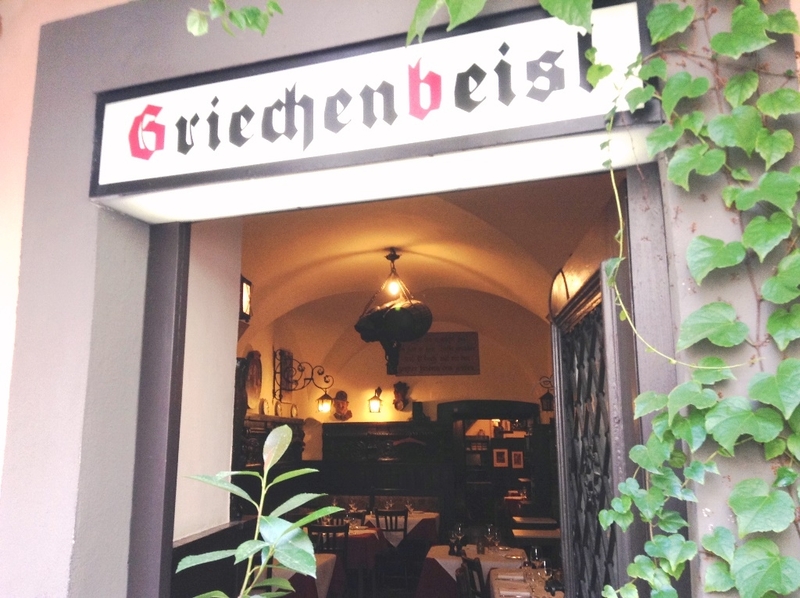 Translated, the name “Griechenbeisl” means “Greek Tavern” but the Zwiebelrostbraten, Wiener Schnitzel and Tafelspitz you’ll find on the menu are all true Viennese specialties and have nothing to do with Greek food. The Greek in the tavern name refers to the Greek traders and merchants who liked to dine here in the 1800s. The house came under attack twice when Turkish invaders attempted to seize Vienna (1529 and 1683). 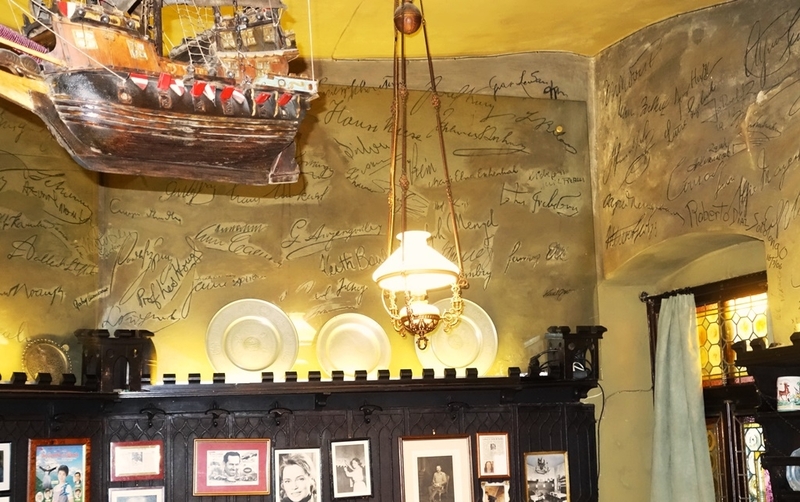 A remnant is still visible inside the tavern — a cannonball from 1529 which was unearthed during renovation work in 1960 and remains stuck in the wall near the stairway at the entrance. Over the centuries, the tavern has expanded and along with it, the amount of rooms. Today there are eight dining rooms, each preserved in a different era and style. My personal favorite is the Twain room which you can request when making reservations (always make reservations before coming) but can be difficult to score since it is often reserved for private parties. 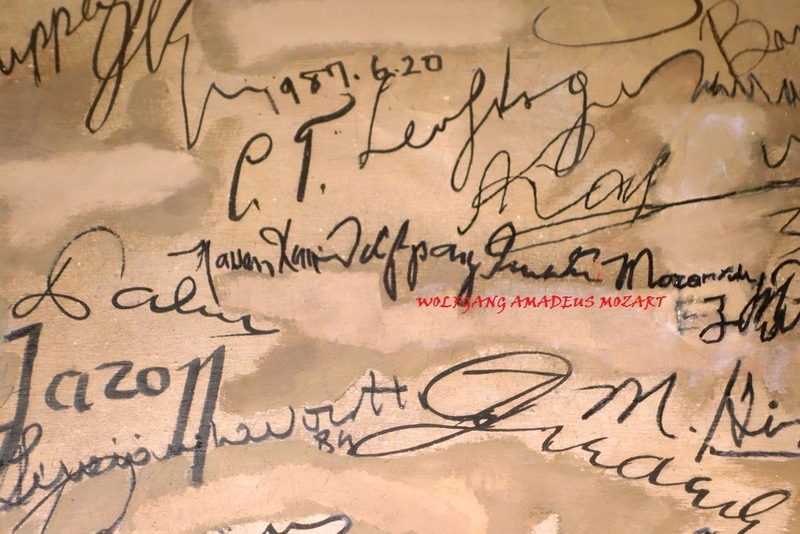 The room is considered a historical monument and the ceiling is filled with the signatures of all the famous folks who have dined and drank within the walls. If you don’t land a lucky table in this amazing room, kindly ask your waiter if it is possible to have a look in. The waiters have long sticks that they can use to point out some of the better known guests. Historic guests include Beethoven, Mark Twain, Schubert, Wagner, Strauss, Count Zeppelin, Mozart, and Brahms to name a few. Then you have the more recent “promis” and these include, amongst others, Johnny Cash, Pavarotti, Barry Manilow, and Phil Colins. The guy who seems to be sleeping off his hangover in a cage in the floor at the entrance isn’t some sorry sap who failed to pay his beer tab. Well, then again, maybe he is. But if you pause and listen, you might hear him whistling the song written in his honor and since sung by beer-mug-swinging admirers for decades– “Oh du lieber Augustin.” Supposedly he (Marx Augustin) sang and drank here in 1679. But he became famous because he was so intoxicated that when he fell into the pit dug out for the city’s plague victims, he simply made himself cozy and slept off his hangover (and you thought you woke up in some shocking places the morning after). We all know the amazing clensing powers inherent in an Austrian apricot Schnapps, so it shouldn’t come as a surprise that good old Marx climbed out of the grave the next day and was fit for another round (and I’m not talking about the row-row-row-your-boat musical kind). A meal in the Griechenbeisl will set you back — just for the main course — anywhere between 17 and 28 € depending on what you order. Granted, not cheap but this is no fast food joint and they do take plastic. Waiters decked out in suits and bow ties who can switch languages in a blink of an eye and actually correctly serve your Zweigelt in a decanter are bound to send your date’s heart aflutter. The menu is in German and English and you might even get some live music accompaniment from a zither for your meal (if you really want to show what a good guy you are, discreetly tip the zither player as you leave). The wine cellar is currently being renovated and sometime later this year, the restaurant plans to host wine tasting events. This isn’t Applebees or The Cheesecake Factory so leave your shorts and tennis shoes at home. Dressy casual is fine here but don’t expect to eat and run. Have an appetizer, have a Grüner Veltliner or Zweigelt, a Melange, a Schnapps and some very good Viennese food and then sit back and listen to the rustic tales of history and whisper to the walls some new ones of your own. Conversation at a neighboring table filled with no less than ten older refined gentlemen and not one single lady. Waiter: Ah! A round of just gentlemen! One of the guests from the table: laughing Indeed! Tonight we left the ladies at home. Waiter: I don’t believe a word of it. Tell the truth. You guys all got kicked out. What you need to know before you read this: my best friend is Australian and sadly for us, she lives where the kangaroos are actually animals and not cars. What you also need to know, she usually has very good taste. But no one’s perfect. Best friend with questionable music taste: Getting ready for Eurovision Grand Final?! I’ll call you in (our wee morning) [two dancers pictured + fireworks or something that looks like an exploding piece of pizza.] Hope you’re covering it. No. In fact. I had been gracefully ignoring it. All week. Stubbornly. 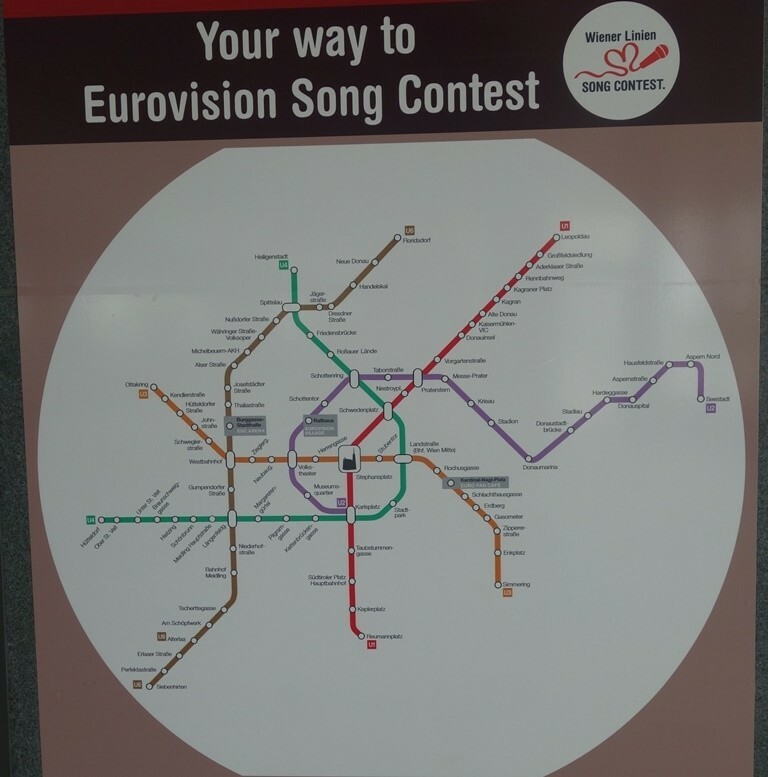 Even through the steady stream of music flowing from the Eurovision Village through my open work window every single day. For hours on end. Didn’t want to rain on her parade — after all I heard somewhere (there was no avoiding news of the big event all week) that the Aussies were Eurovision Contest virgins which could partially excuse their oh-so-pink, squeaking giddiness. Best friend with questionable music taste: [More smileys] [Equally stubborn]. Are you excited? Me: I’ll be excited when it’s over [speak-no-evil monkey emoticon] You guys are nuts. Before I could exclaim, “My God! What have I done? How did I get here?” I found myself in a room with a bunch of Eurovision song contest enthusiasts at midnight on Friday night, weighing in on the ill-placed shoulder pads of one country’s jury announcer, the unfortunate on-coming traffic background image of another’s (don’t they have better sites to show off to the world in Georgia?) and the all-too frequent navel-line (as opposed to neckline) trend in many of the dresses. Oh yeah – and let’s not forget Miss Poland’s bird-nest-in-hair-accessory. Fate has a cruel sense of humor. When it comes to fashion. When it comes to me. Twenty-seven countries. Two-hundred and fifty artists and 200 million people watching! I think I must have been the 200 millionth person to join in. Best friend with questionable music taste: Isn’t it fantastic! [smiley] We got up at 4:45 am!! We can even vote this year [more smiley, martini glass]. Twenty minutes in and it’s all about Austria at least getting a point more than Germany. Best friend with questionable music taste: [two icons – no longer smiling – one looking more distraught than the next] What were we thinking? Poor Austria. Best friend with questionable music taste: We have Conchita. Me: Conchita Unstoppable! What is she doing? Best friend with questionable music taste: Standing with that silver thing over her jumpsuit – why do people wear jumpsuits? Zilch for Austria. Not one of the 27 countries voting gave Austria’s Makemakes a single point. Ahhh. Aren’t they as sweet as a Lebkuchen Herzerl? And the Aussies? A not-too-shabby 5th place with 196 points! So deserved for ruffling themselves out of the hay to voluntarily (!) be inundated with glitter, glam and bubble gum music. Heaps of fun, eh Matey? And my friend deserved it – a point for every exclamation mark she texted me in the past week. How can you not love those guys? Austria may have not gotten a single point but neither did Germany. What started out as a pilot project is here to stay. 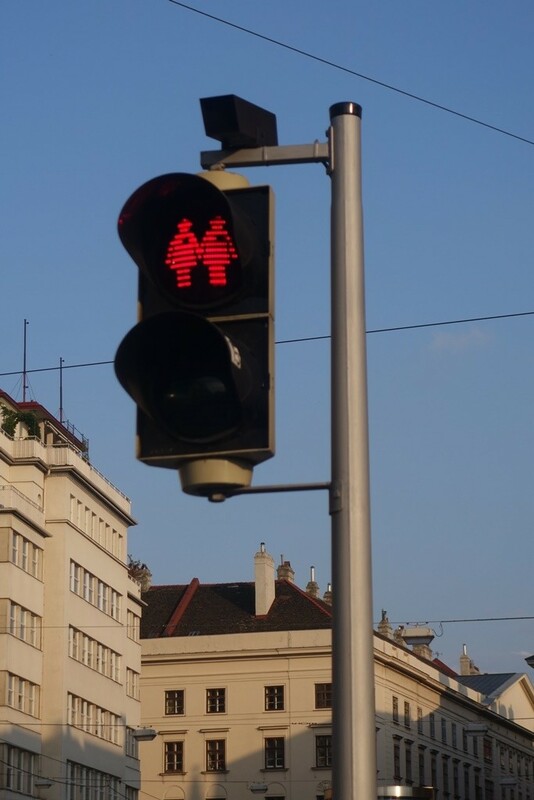 Vienna’s pedestrian cross walks have gone viral. 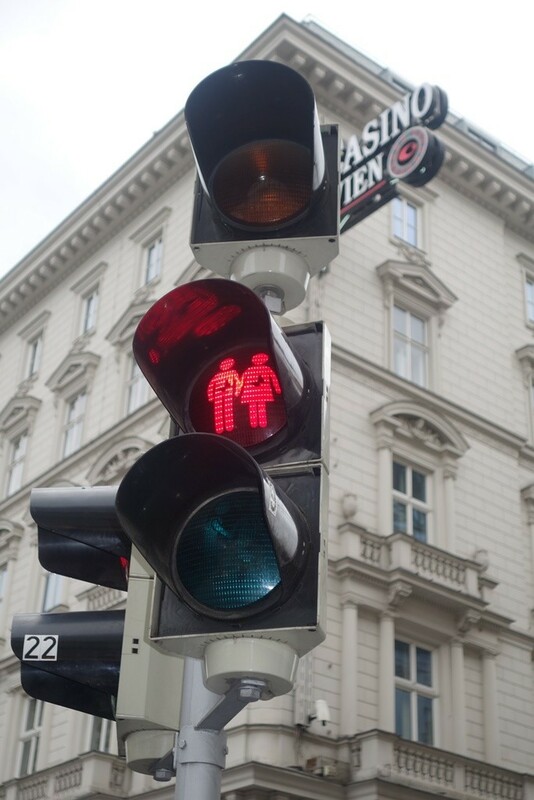 The New York Times, Guardian, NPR, BBC, — the whole world’s abuzz with Vienna’s traffic lights. And now everyone wants one too. Innsbruck, Salzburg, Linz – hold onto your Lederhosen because they’re coming to town! There hasn’t been this much chatter about traffic lights and pedestrian crossings since the Beatles released the cover of their Abbey Road album and protests broke out after German Reunification when the West German Ampelmännchen tried to strong-arm his way onto all the traffic lights in the country and bid the old DDR Ost-Ampelmännchen Auf Nie-Wiedersehen. 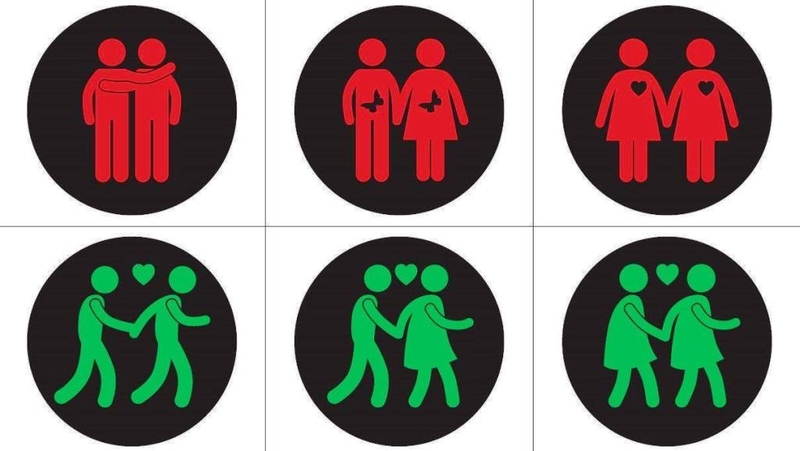 Way back in 1961, traffic psychologist, Karl Peglau, suggested to the East German Department of Transportation that every traffic participant should receive his or her own traffic light due to the psychological impact of the images on the behavior of pedestrians. I’m sure he would have had no problem raising the money for his cause. But – hey – will someone donate some good music to the guy’s Youtube video? It’s a pity not to have good tunes to go with such a great coup d’état. But Vienna’s change isn’t the work of Mr. Týc. 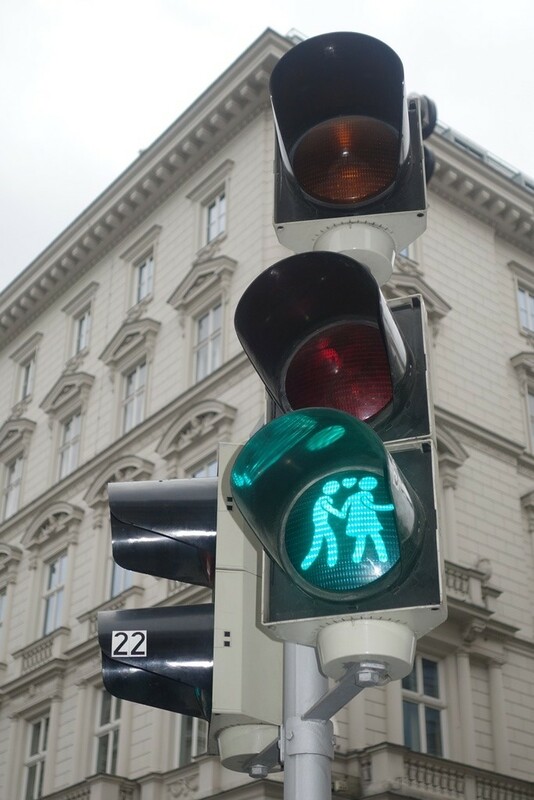 Alongside the WHO’s May traffic safety week, wedged between the Vienna Lifeball and the Eurovision Song contest, the Austrian Green Party moved to install 49 traffic lights throughout the city that blink not one lonely red guy waiting or green guy walking, but suddenly two people waiting and walking – sometimes arm-in-arm, sometimes holding hands, or accompanied by a sweet little heart, but the always in pairs – hetereosexual or homosexual. The lights aren’t just a sign of safety, but a symbol of tolerance. And Maria Vassilakou of the Green Party who is also the Vienna Council Member in charge of traffic safety, just announced that the lights are here to stay. I’m not sure about the safety aspect, though. In attempting to get some pix for you, both red AND green, I had to keep one eye on the traffic and one on the on-coming bims. Want a photo of the lights? Use mine. Don’t risk your life! Those bims move fast and brake slow. Now say “Ampelpärchen” 3 times fast followed by “Vassilakou” 3 times faster.